Introducing the brand new yarn from Baa Baa Brighouse. Baa Baa Beats consists of unrepeatable, exclusive, one-of-a-kind, hand painted skeins that take their names from song titles. 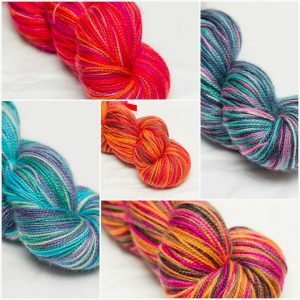 This is the second completely unique batch of this yarn that we have released. The first was inspired by the music of California based band, Counting Crows and included ‘Sullivan Street’, ‘Perfect Blue Buildings’, ‘Miller’s Angels’, ‘Hard Candy’ and ‘Mercury’. The current batch is inspired by the work of Seattle band, Pearl Jam and includes ‘Jeremy‘, ‘Even Flow‘, Corduroy’, ‘Indifference’ and ‘Amongst The Waves’. 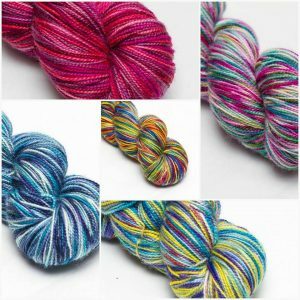 Baa Baa Beats is a 100% British Bluefaced Leicester High Twist 4 Ply Sock Yarn. It’s variegated nature means it is perfect for both socks and shawls. However, these skeins are complete one-off originals so once they’re gone, they’re gone! Because of their exclusive nature, these skeins tend to be snapped up very quickly. We will be releasing more Baa Baa Beats at intervals throughout the year – always in batches of five. If there’s a musician that you would like to see featured in the Baa Baa Beats collection, why not get in touch with your suggestions? Mamma Mia – More Baa Baa Beats!